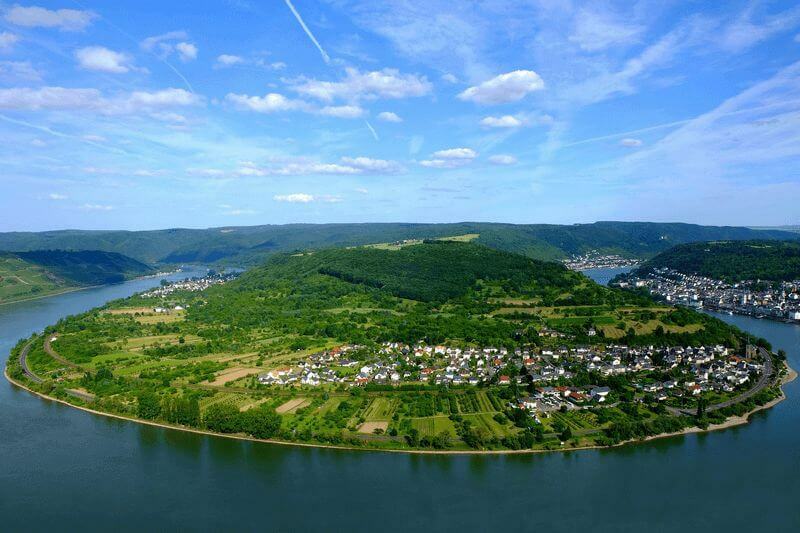 This tour is without doubt a journey along two very contrasting and beautiful German rivers – the Rhine and Neckar. The romantic Upper Middle Rhine region is famous worldwide as a river valley straight out of a picture book, with towering cliffs, steep vineyards, castles perched on virtually every hilltop and pretty villages lining the river banks. 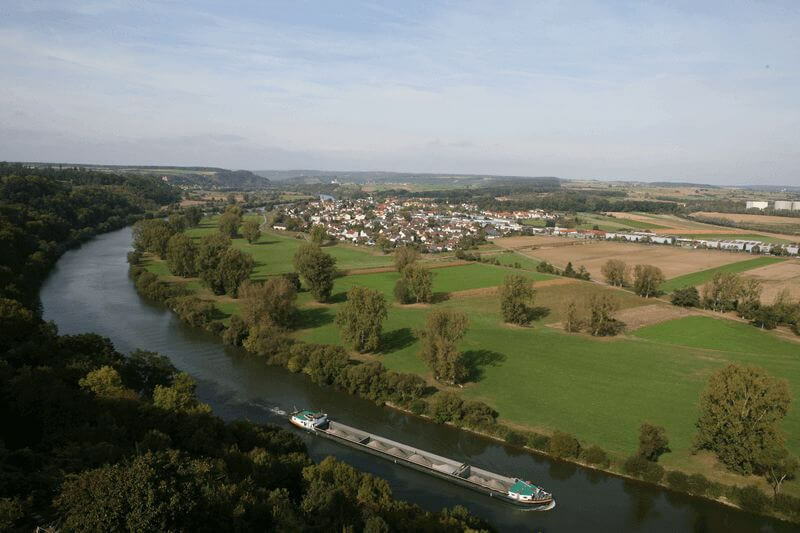 By contrast, the Neckar valley, unlike the Rhine, is a well-kept secret, known only by a very few tourists outside of Germany. 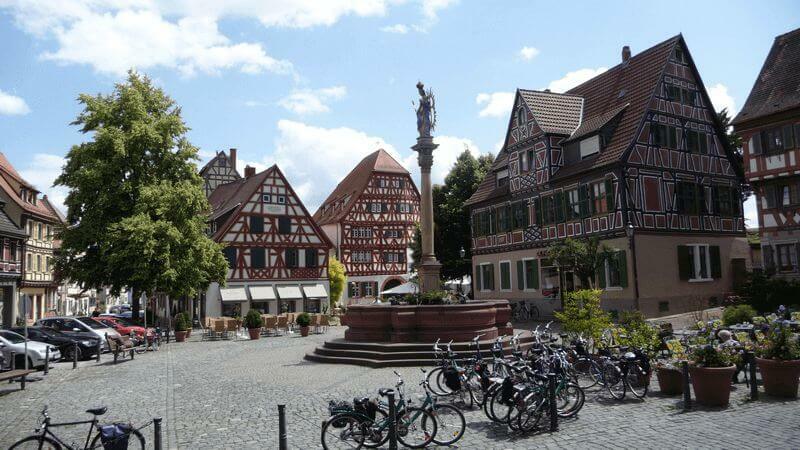 The Neckar valley boasts picture postcard medieval towns and villages, breathtaking views of castles and beautiful scenery at every turn of the river … it is simply a romantic gem, waiting to be discovered by you on the best form of transport possible – a bicycle. 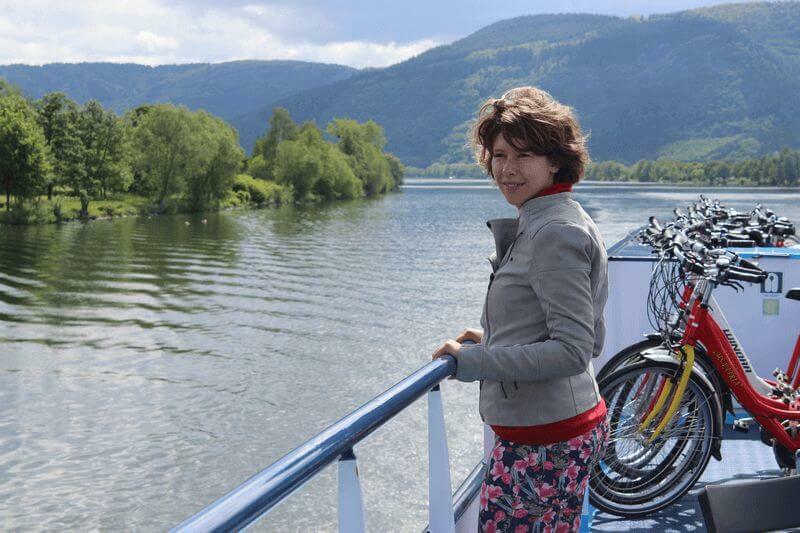 During this 8 day/7 night boat and bike tour, you are in for a very special treat as you explore the most beautiful sections of the Rhine and Neckar Rivers by bicycle. The cycle paths along the banks of both the Rhine and Neckar Rivers do not have any gradients of note and are asphalted or paved. 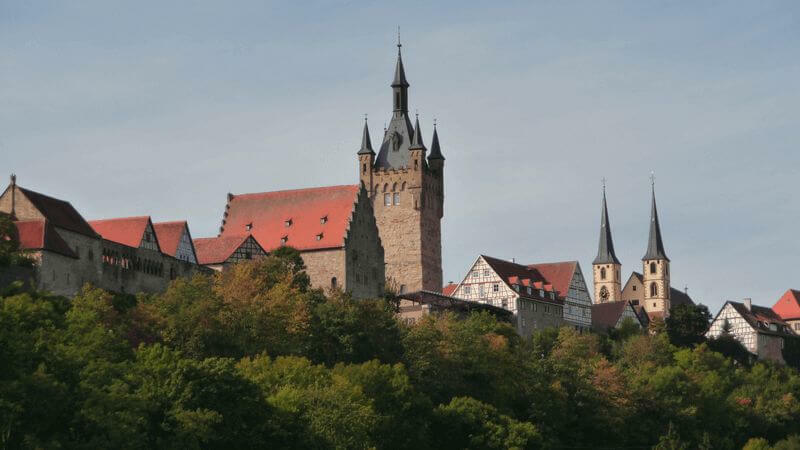 While the Upper Middle Rhine is famous for its history, castles and medieval towns and villages, it is the much lesser known Neckar valley that promises to be the surprise card on this particular tour. 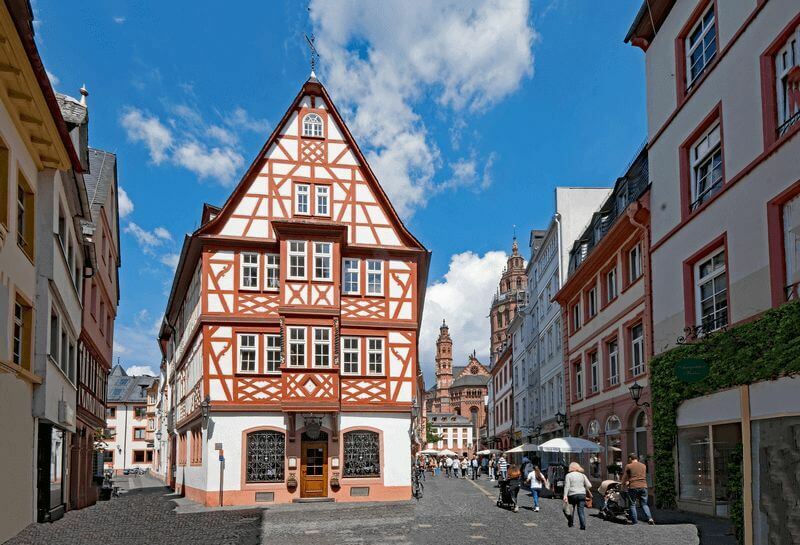 What you will discover along the Neckar are ornately decorated half-timbered houses, impressive churches, castles, palaces and many historic monuments. Every city and village along the river has a unique atmosphere of its own, while the natural beauty of the valley has to be seen to be believed. At the end of the tour it will be interesting to see what your favorite valley was. 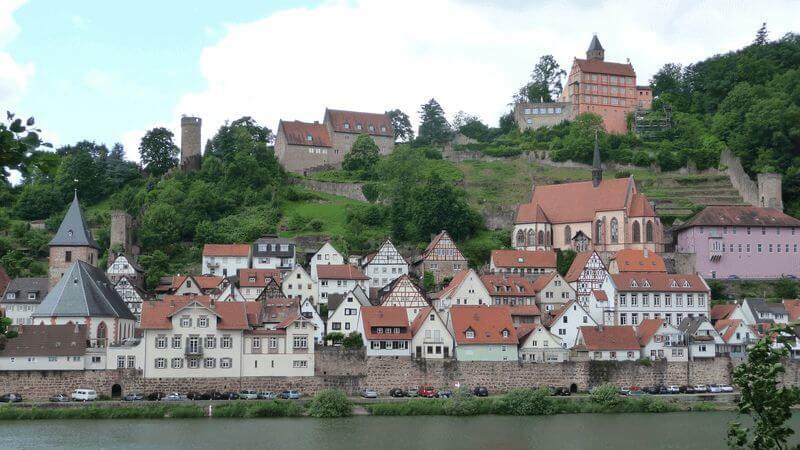 Will it be the Neckar and its towns of Marbach am Neckar – famous worldwide as the birthplace of the classical poet and dramatist Friedrich Schiller – the historic old town of Eberbach, beautiful Heidelberg, the city of romanticism or the idyllic and romantic spa village of Bad Wimpfen? 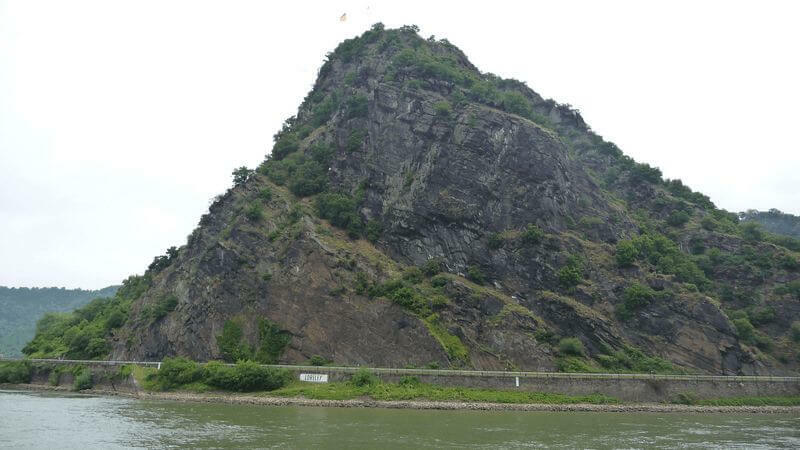 Or maybe it will be the “Father Rhine”, which is associated with the famous Nibelungen saga, the Loreley rock, some of the best preserved medieval castles in Germany between Bingen and Koblenz or Mainz and its many museums… it will be an interesting choice. It is possible to combine two beautiful tours to create a particularly diverse 15-day boat and bike holiday on the Patria. 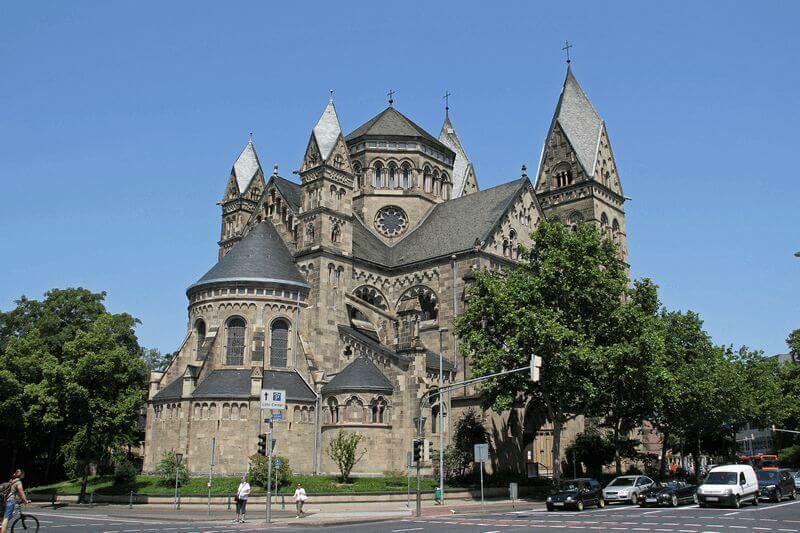 The journey along the Rhine and Neckar Rivers takes you from Koblenz to Bad Wimpfen; the return trip taking place the following week from Bad Wimpfen back to Koblenz. 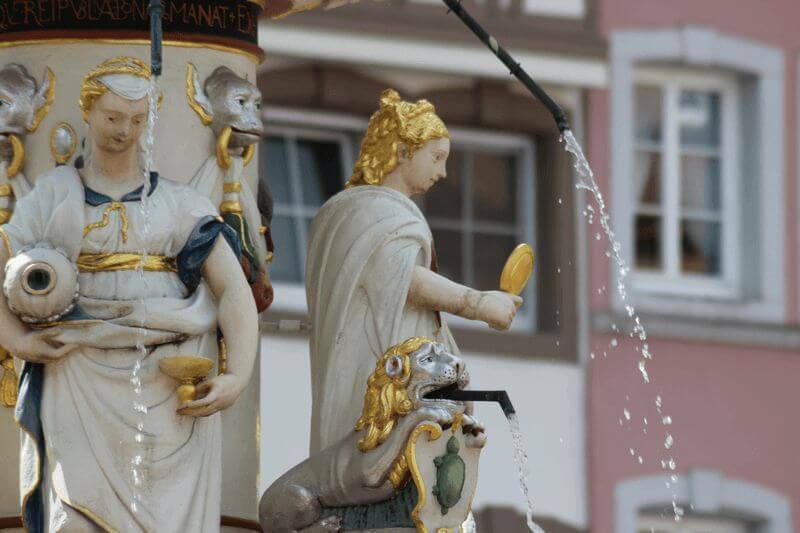 On various dates, the Patria also sails along the Moselle and Saar rivers from Koblenz to Saarburg and returns a week later, with highlights including the Roman city of Trier and picturesque towns like Cochem and Bernkastel. 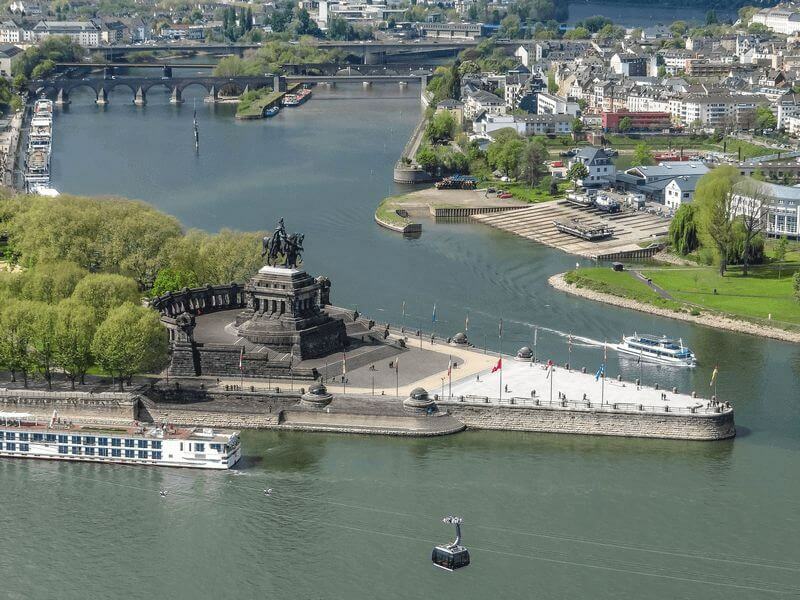 The Patria awaits you in Koblenz where the crew will welcome you on board from 4 p.m. Your first night will be spent in this fascinating and historic city, an important defensive and economic center for centuries. 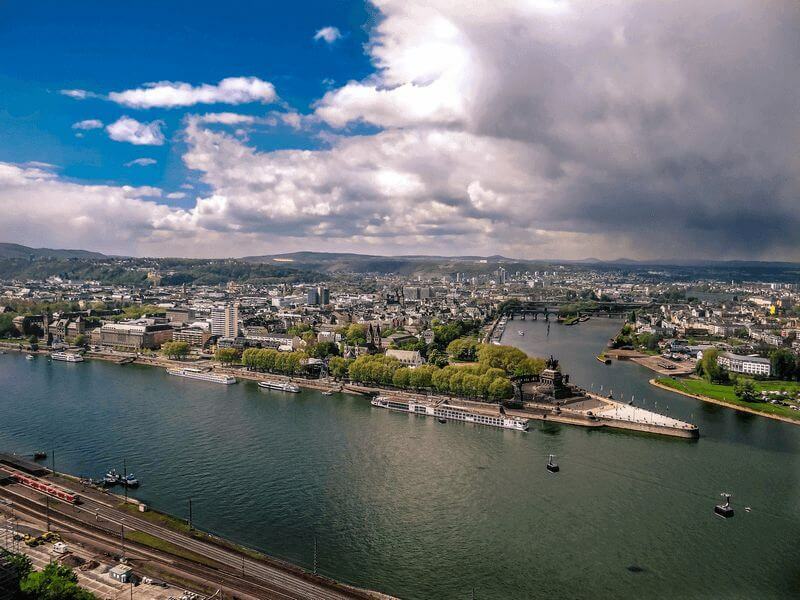 Highlights include the old castle of Ehrenbreitstein, which dominates the right bank of the Rhine, the 12th century “Alte Burg” Castle and old Koblenz town. 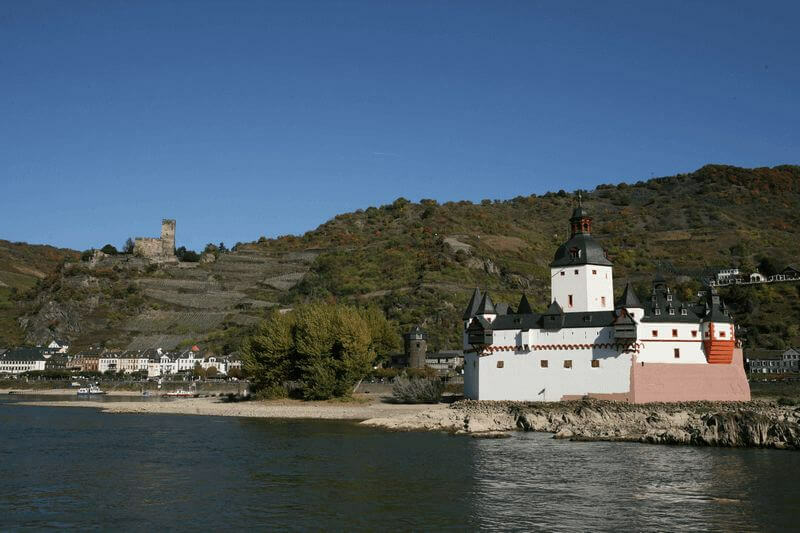 Your cycle tour starts with the Patria sailing downstream along the river Rhine from Koblenz to Boppard – where the Romans set up a fortress 2000 years ago to guard the river – along the beautiful UNESCO heritage-listed Upper Middle Rhine Valley. From there you will cycle on the left bank of the river past towering castles and through the Lorely valley to Rüdesheim. 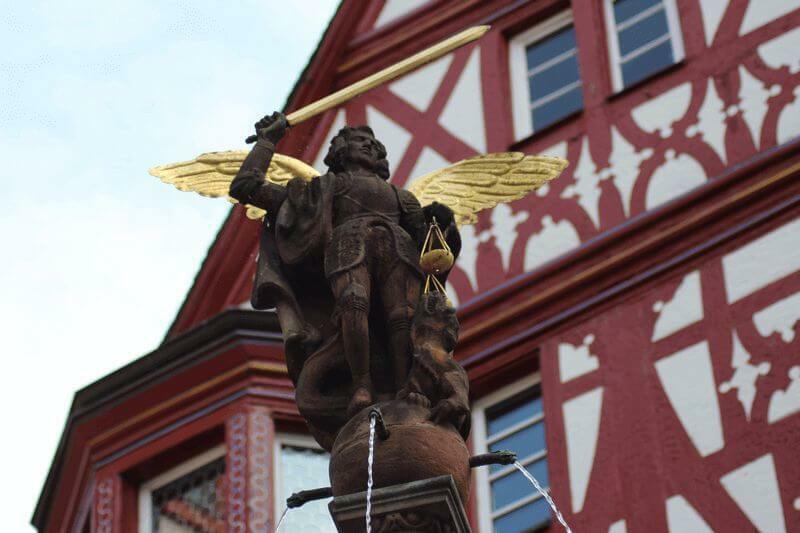 Your night will be spent in either Rüdesheim or Bingen. 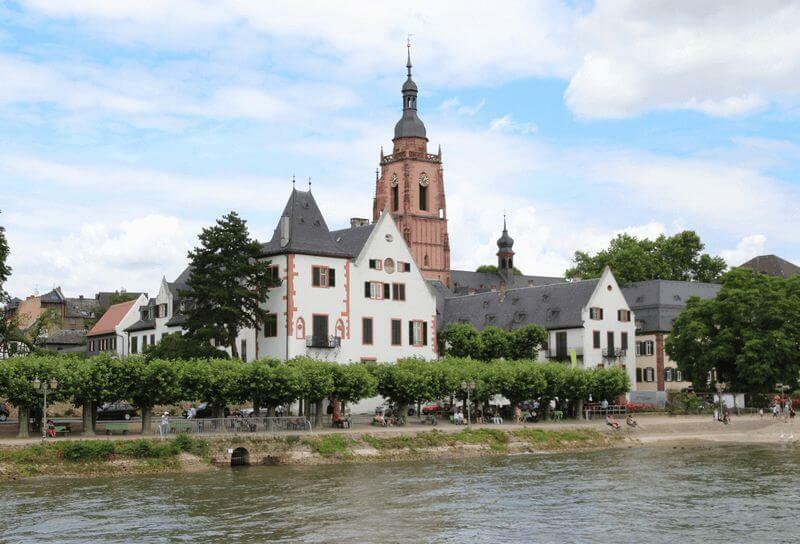 Today you will have the choice of cycling on either the north bank of the Rhine from Rüdesheim through the beautiful Rheingau district to the historic village of Eltville and then onto Mainz or along the quiet left bank directly to the city of Mainz. 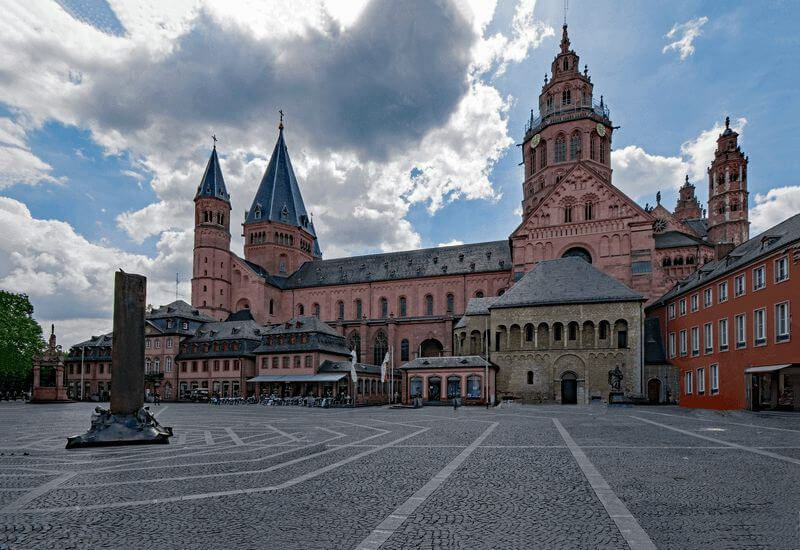 In Mainz, a city with a rich history dating back to Roman times, you can enjoy many churches, museums and monuments. The most important are the Dom (cathedral), the Royal Palace, the State Theatre, the Citadel and the monument of Gutenberg. 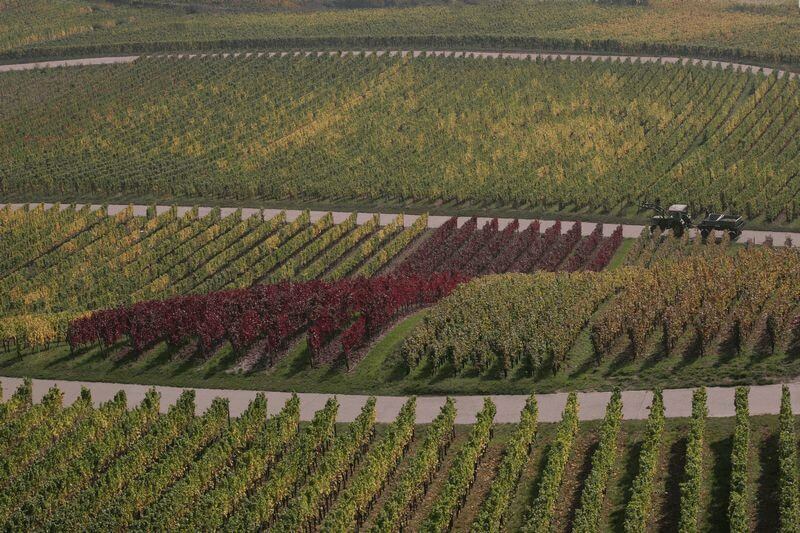 Today’s cycling will take you via Laubenheim to Nierstein, the biggest vine growing community on the river Rhine and at the same time, a popular destination for exploring the vineyards with a tractor wagon. 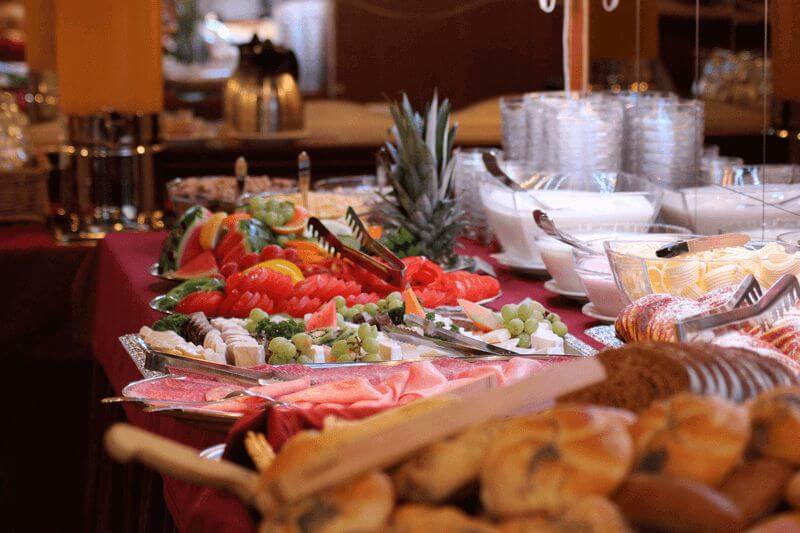 Here you will re-join the Patria to enjoy lunch on board. 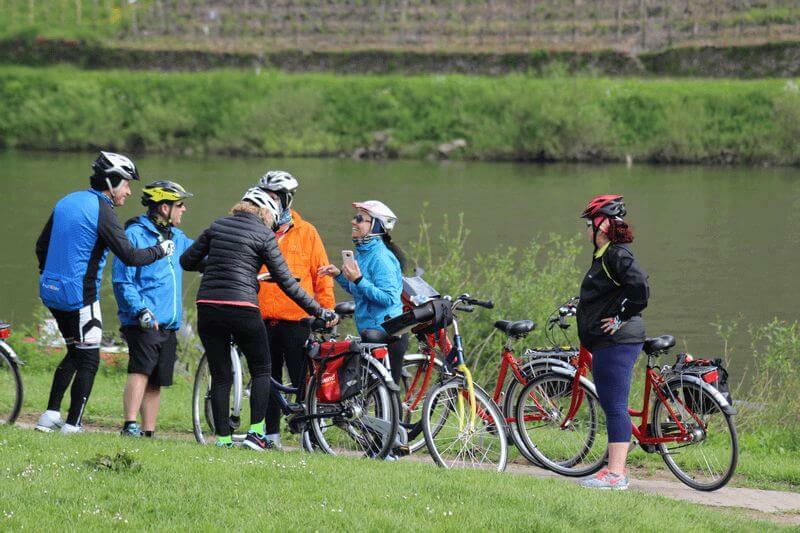 Today the Patria will take you along the Rhine and into the Neckar River to Mannheim where you will start cycling to Heidelberg, your destination for the day. 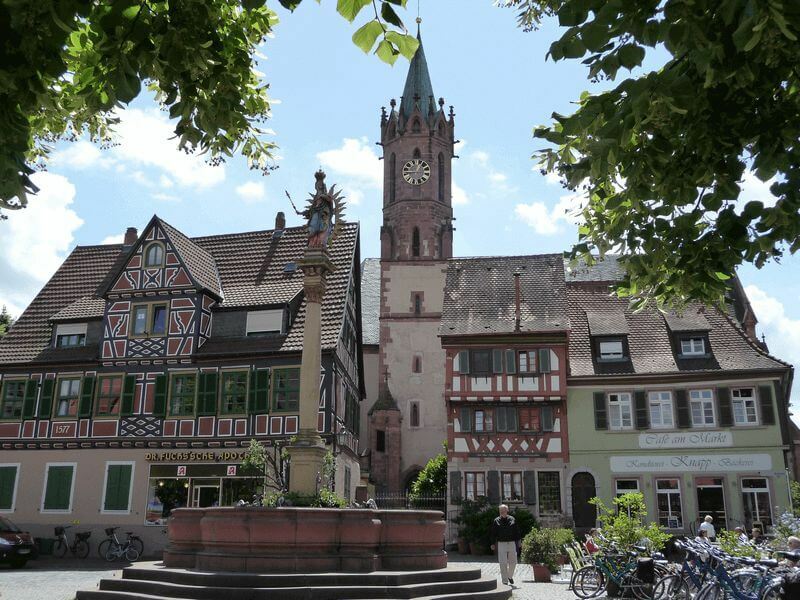 Along the way you will pass through the Celtic city of Ladenburg, one of the most colorful and best preserved villages on the Neckar River. In Heidelberg you can walk through town and/or to Heidelberg Castle on your own. 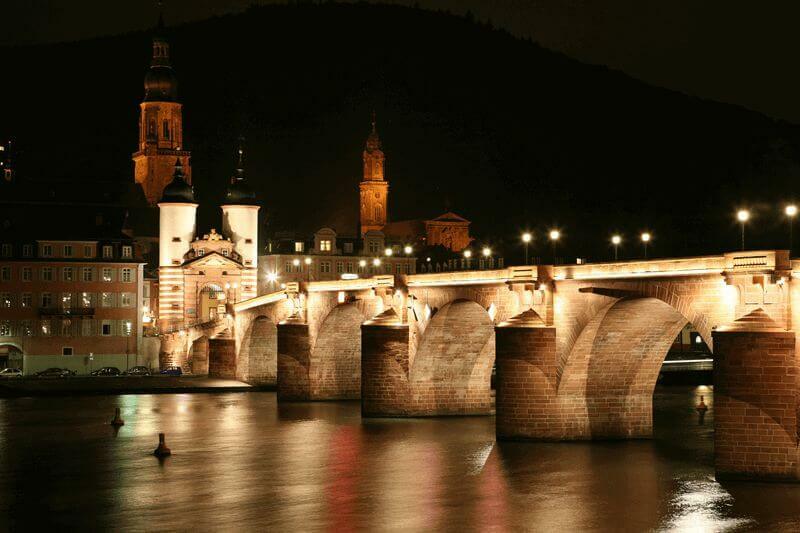 Heidelberg is a city that attracts tourists from all over the world keen to visit Heidelberg Castle, the Old Neckar Bridge, Philosophers’ Way, the narrow, winding alleys of the Old Town, the numerous market squares and the city’s magnificent churches. 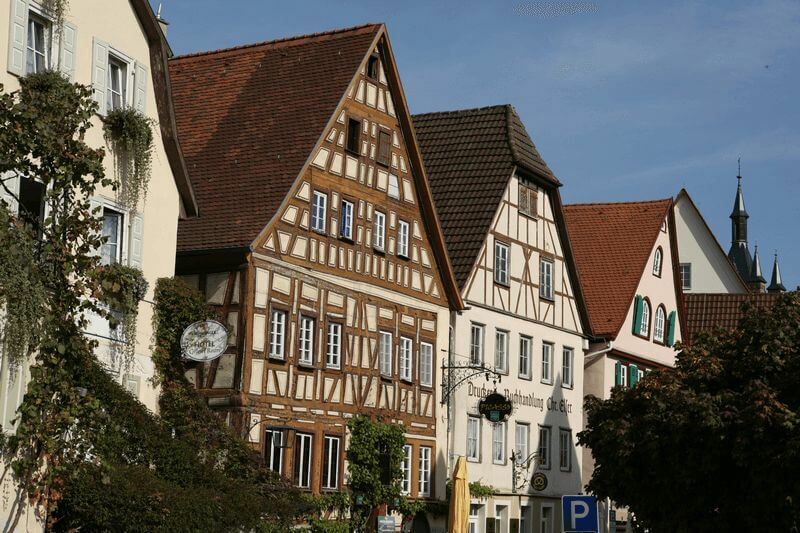 After breakfast you will cycle from Heidelberg via Ziegelhausen through the low mountain range of Odenwald to Neckarsteinach – famous for the four old castles that guard the village – to your destination for the day, the historic village of Eberbach. 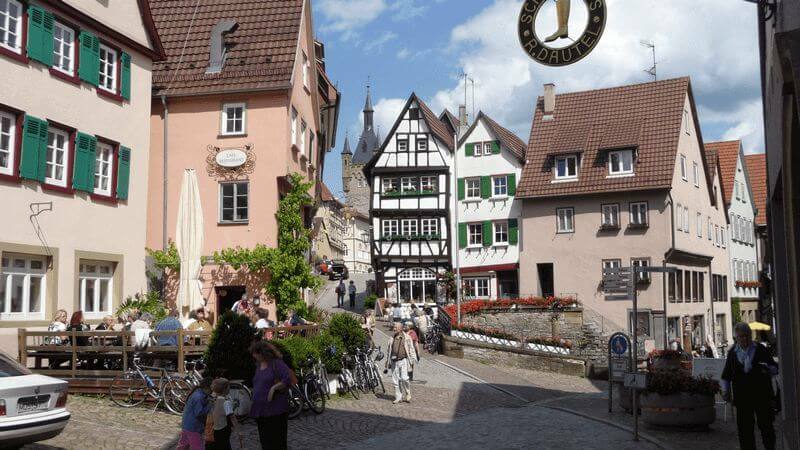 While strolling through the winding streets and small squares, you can enjoy the serene life of the old city of the Hohenstaufen. 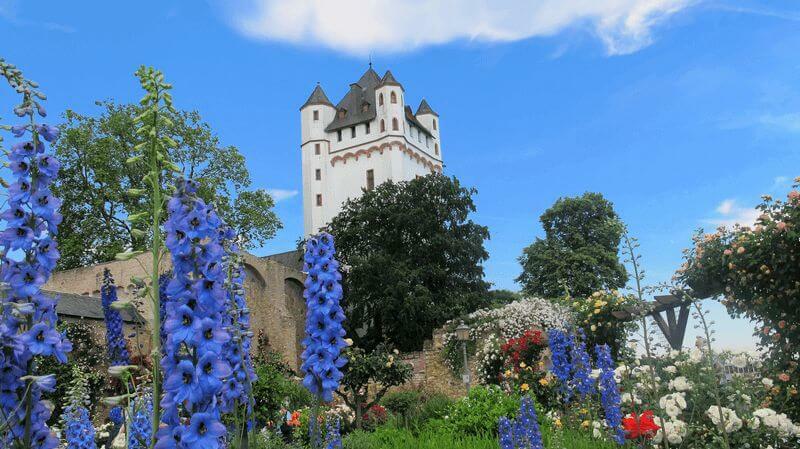 The first stop on your final day of cycling is Burg Hornberg (Hornberg Castle) in Neckarzimmern. A partially ruined castle located on a steep outcrop overlooking the Neckar Valley, it is the largest and oldest castle in the valley. 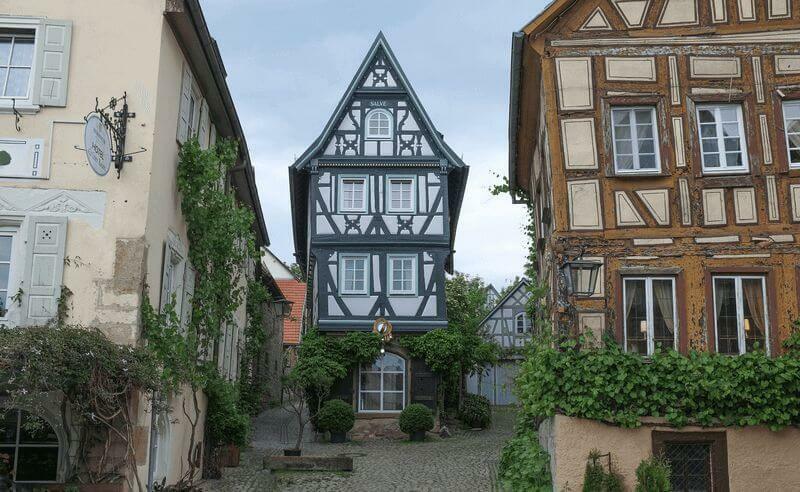 After visiting this “Burg Hornberg” you will cycle to Bad Wimpfen, the destination of this tour. 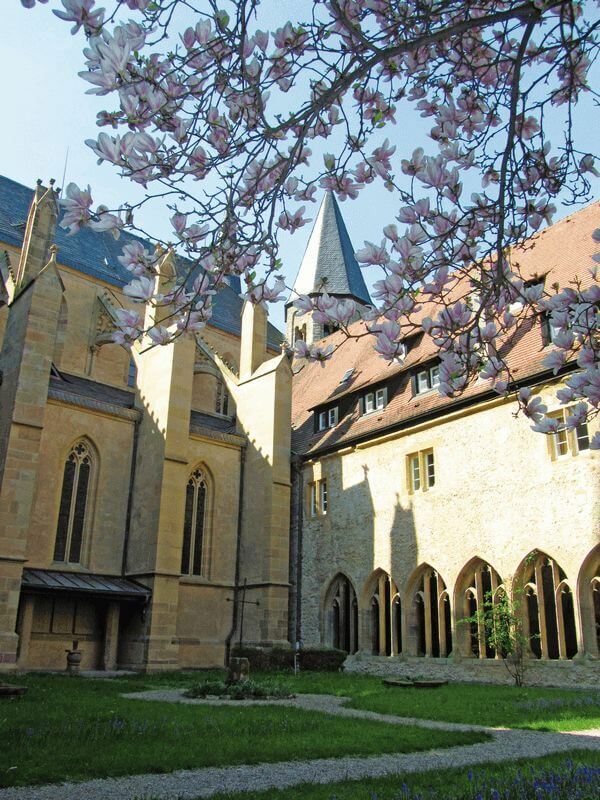 Make sure you explore Bad Wimpfen, a famous health resort on the river Neckar. The idyllic and romantic spa village is especially well-known for the warm, salty and revitalizing water that attracts people from throughout Germany and beyond. The main sights are the Blue Tower, the “Steinhaus” (Stone House) and the medieval old town. End of your tour: Disembarkation after breakfast until 9.00 a.m. The daily cycling tours are non-guided, independent tours. You will ride individually with the help of a detailed cycling map and printed route notes (available on board). The on-board tour manager will provide you with all necessary tour information during her/his daily briefings. The on-board tour manager doesn’t cycle her-/himself but can always be reached on her/his cell phone. During days when two bicycle options are possible, not all mentioned highlights can be visited during the short cycling option. In case you prefer a day of rest, you can skip the cycling tour and relax on board while cruising to the next town. Bike routes / degree of difficulty: You drive mostly on traffic-free paths, low-traffic routes of agriculture and paved bike paths along the flood dam without any significant climbs, so this trip is also suitable for untrained cyclists. On the arrival day is it possible to bring your luggage on board from 10 PM. Travel documents: EU-citizens (without special situations like dual citizenship, main residence abroad or a limited-validity passport) are required to have a valid passport or ID-card, not expiring within six (6) months of the return of your cruise. We kindly ask non-EU citizens, EU-nationals with multiple citizenship or anybody who has to respect special legal entry requirements for the country to visit, to inform about visa and entry documents at the competent embassy. The Patria awaits you in Bad Wimpfen where the crew will welcome you on board from 4 p.m. 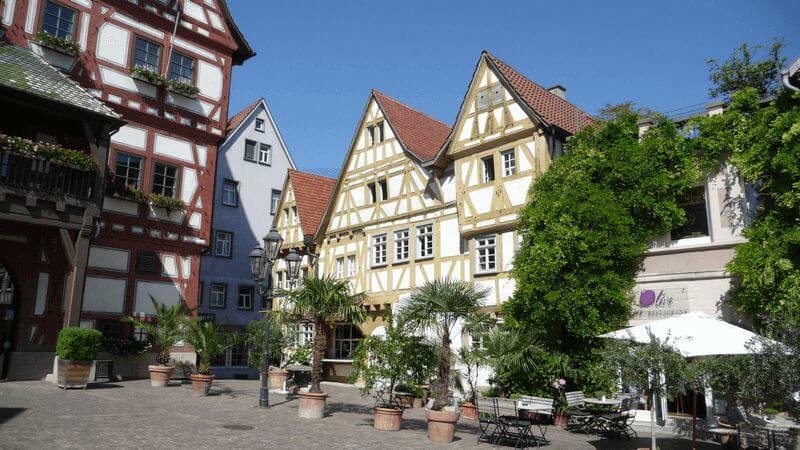 Your first night will be spent in Bad Wimpfen, an idyllic and romantic spa village on the Neckar River well-known for the warm, salty and revitalizing water that attracts people from throughout Germany and beyond. 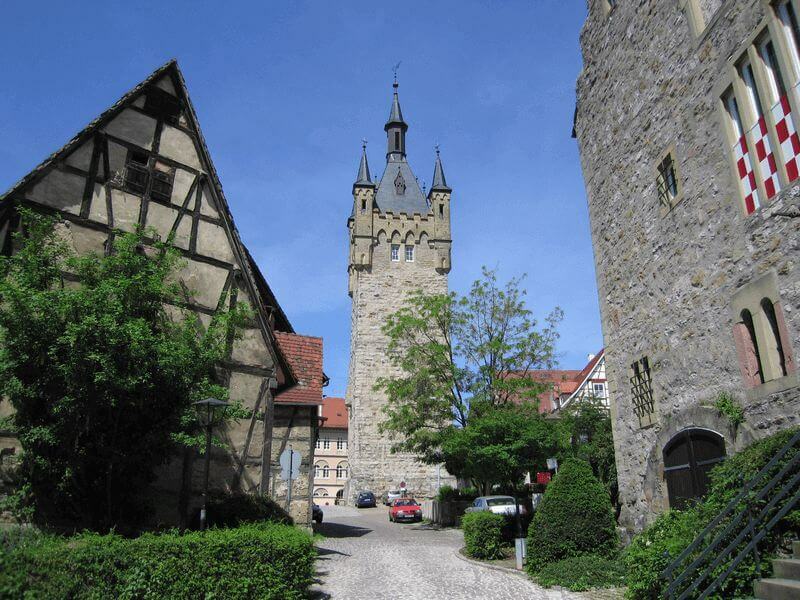 The main sights are the Blue Tower, the “Steinhaus” (Stone House) and the medieval old town. 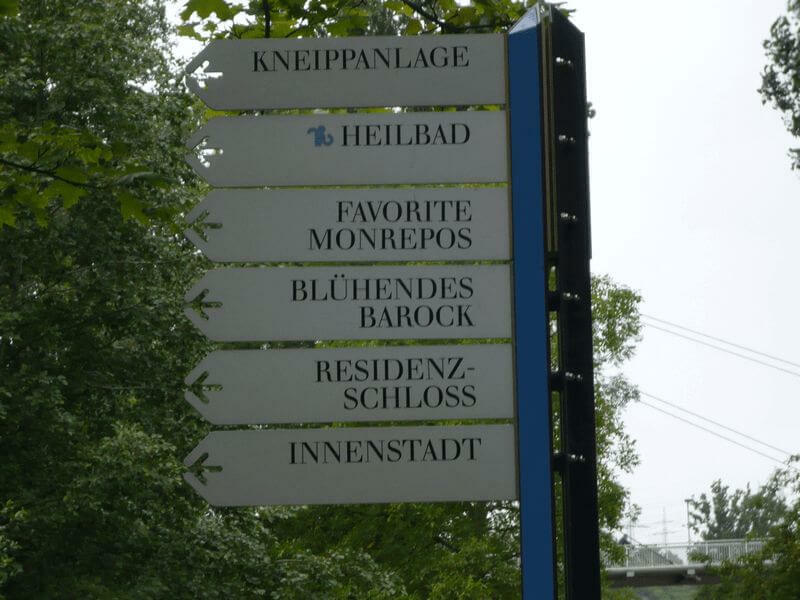 Following the distribution of bicycles you will pedal to Neckarzimmern, where you can elect to either cycle or walk to Burg Hornberg (Hornberg Castle), where Götz von Berlichingen once lived. 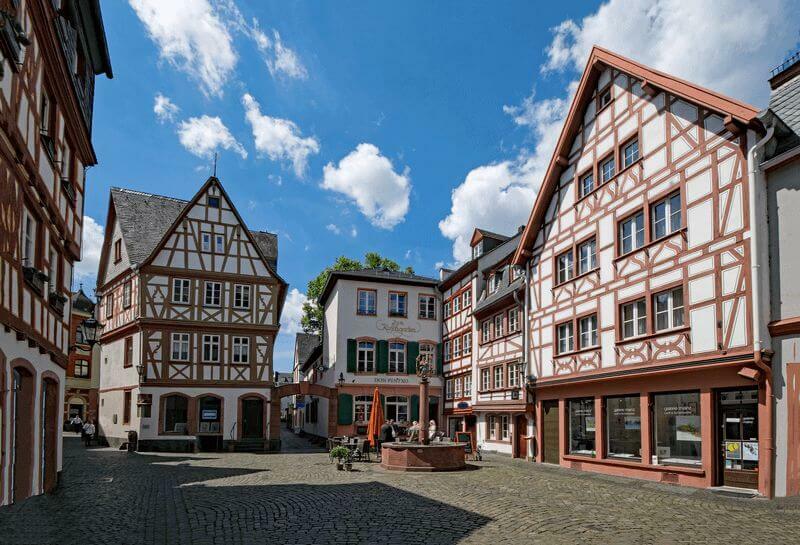 After visiting the castle you will continue to cycle to the historic and picturesque town of Eberbach, your destination for the day. 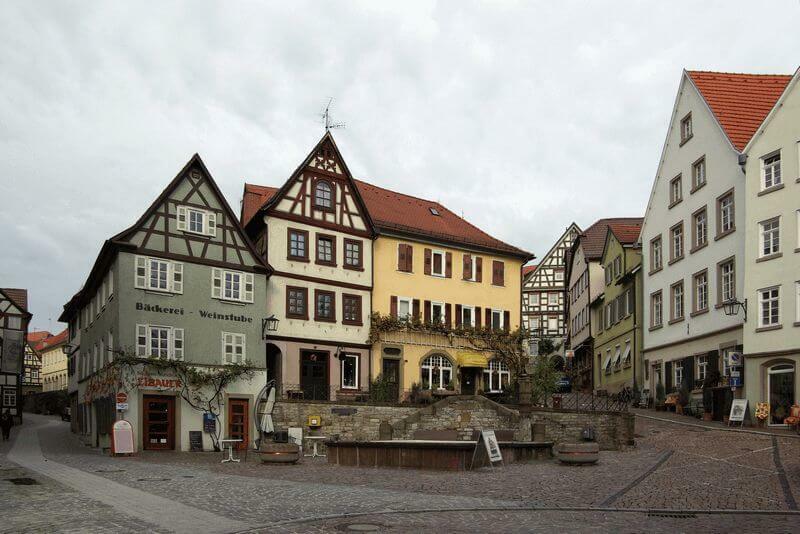 While strolling through the winding streets and small squares, you can enjoy the serene life of the old city of the Hohenstaufen. Your first destination today is Hirschhorn – the “Pearl of the Neckar valley” – situated on a horseshoe bend on the Neckar River. 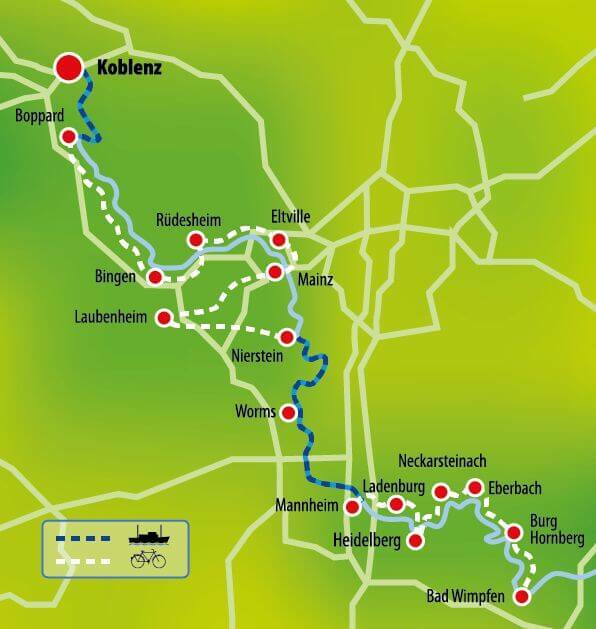 From there you will cycle through the low mountain range of Odenwald to Neckarsteinach, then via Ziegelhausen to Heidelberg where the Patria will be waiting for you. In Heidelberg you can go for a walk through town and/or to Heidelberg Castle on your own. 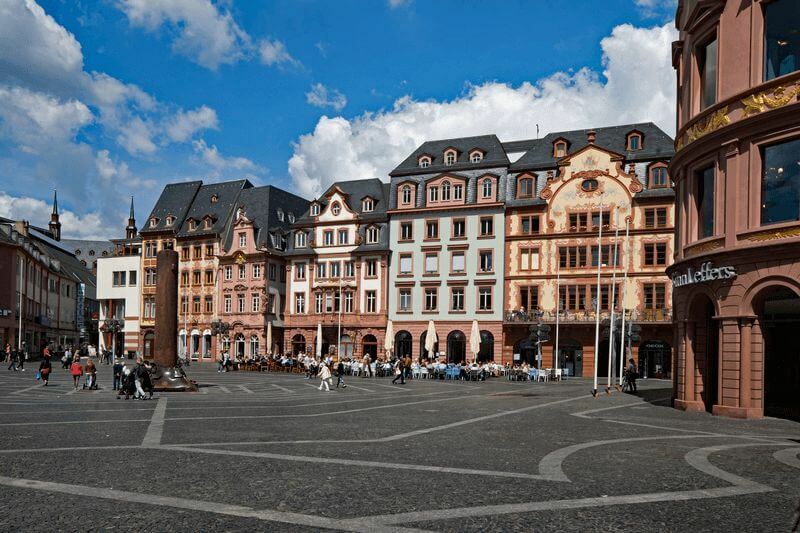 Heidelberg is a city that attracts tourists from all over the world keen to visit Heidelberg Castle, the Old Neckar Bridge, Philosophers’ Way, the narrow, winding alleys of the Old Town, the numerous market squares and the city’s magnificent churches. Make sure you cross the Neckar before leaving this morning for a perfect view of Heidelberg and its famous castle. 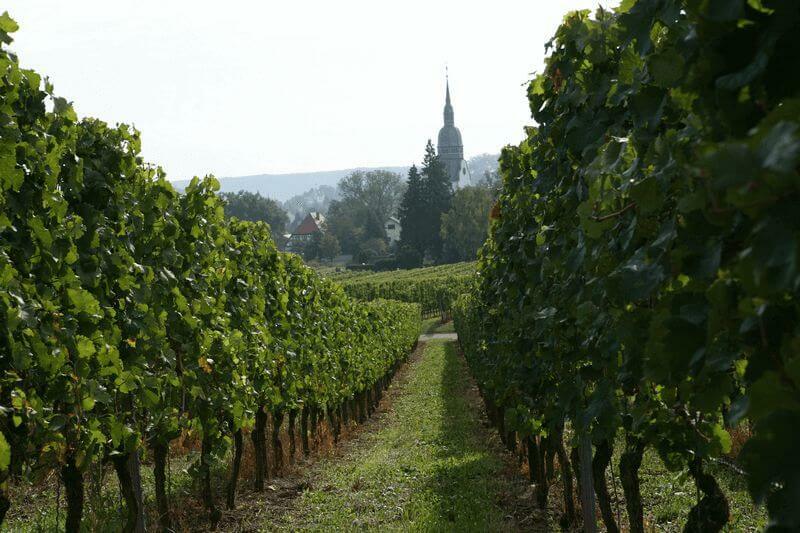 Today you will cycle via Ladenburg, which was founded by the Romans, to Mannheim where you will re-board the Patria for lunch and the journey to Nierstein, the largest wine growing community along the Rhine and a popular destination for exploring the vineyards with a tractor wagon. 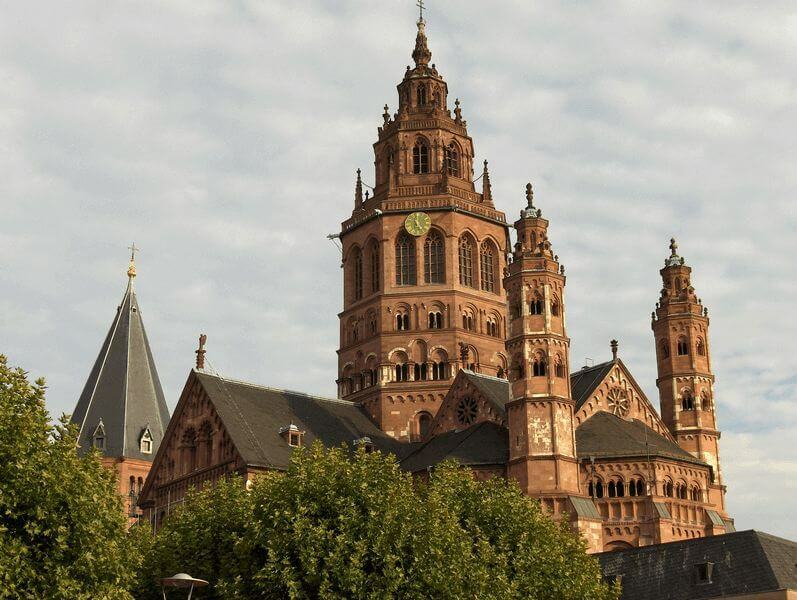 Today you will cycle along picturesque cycle paths next to the Rhine to Mainz, a city with a rich history dating back to Roman times. While you are there take the time to discover the city’s many churches, museums and monuments. The most important are the Dom (cathedral), the Royal Palace, the State Theatre, the Citadel and the monument of Gutenberg. 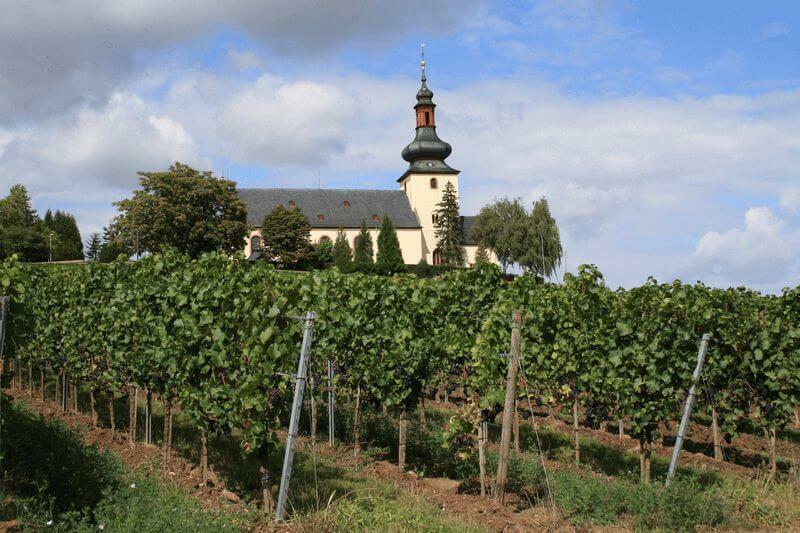 Following breakfast you will pedal from Mainz through the beautiful Rheingau, one of 13 designated German wine regions, via the historic rose town of Eltville to the picturesque village of Rüdesheim. 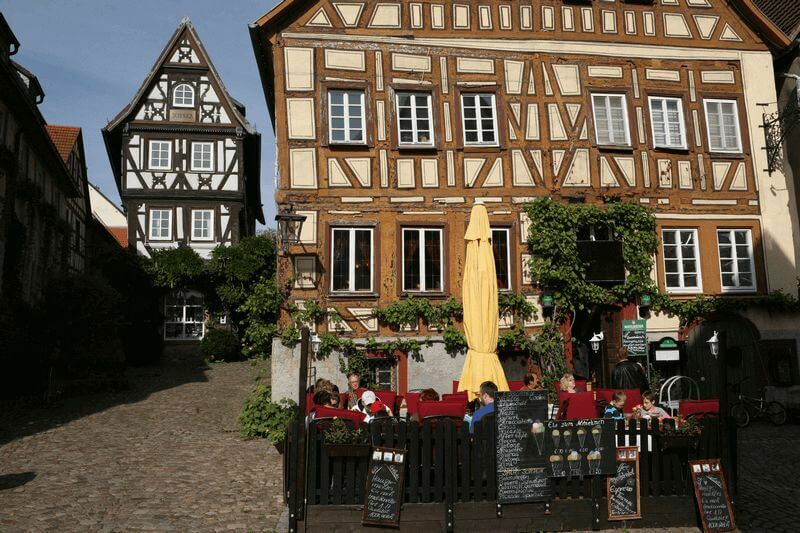 Make sure you take a stroll through the famous Drosselgasse, a lane in the heart of Rudesheim’s old town full of beautifully restored buildings. The Patria will berth for the night in either Rüdesheim or Bingen. 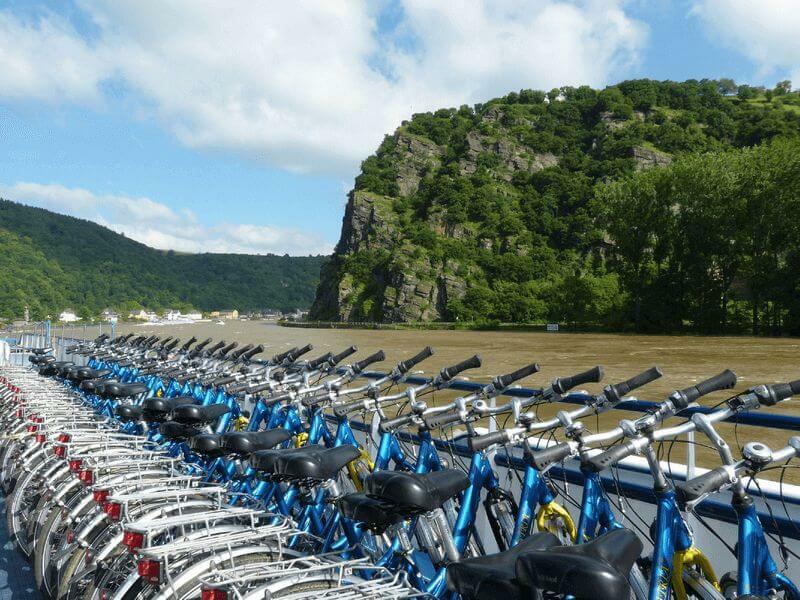 Cycle on the left river bank to Boppard and enjoy the panoramic view of the unforgettable Upper Middle Rhine Valley, a UNESCO Word Heritage site. On your way you will pass castles and burgs alongside the celebrated Rock of Lorely. 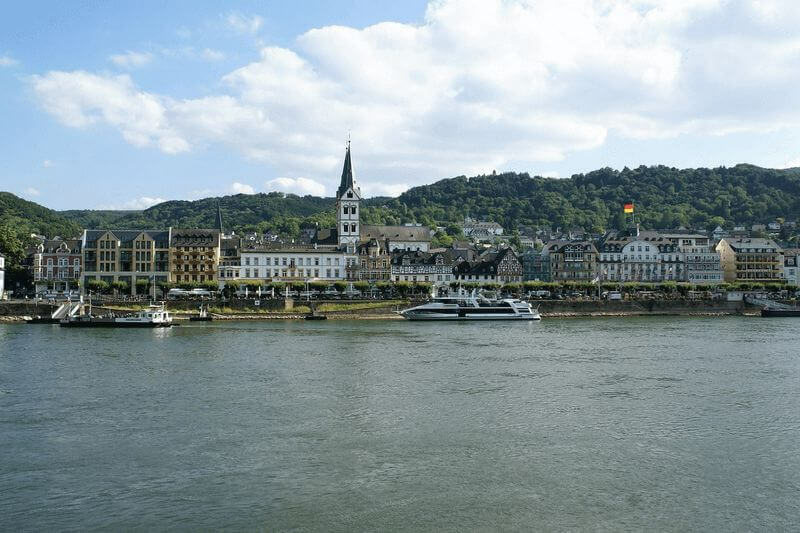 In the afternoon, the Patria takes you to Koblenz where the rivers Rhine an Moselle meet. You will spend your last night on board in this fascinating and historic city, an important defensive and economic center for centuries. 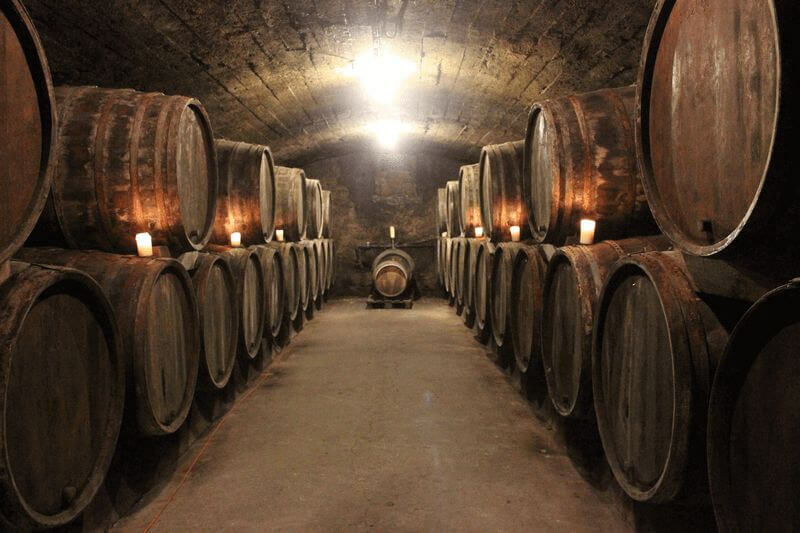 Highlights include the old castle of Ehrenbreitstein, which dominates the right bank of the Rhine, the 12th century “Alte Burg” Castle and old Koblenz town. Between Koblenz and Bad Wimpfen by train (in 3,5 hrs. for ca. € 45 p.p. – group tickets can be bought through the on board tour manager) or minivan (approx. € 85 p.p., min. 4 pers., bike € 15). Limited availability, this will be arranged by the on board tour manager. To be paid on board. Excursion program: when the cycle stages and docking times make it possible an excursion program is compiled, which is bookable and payable only on board. 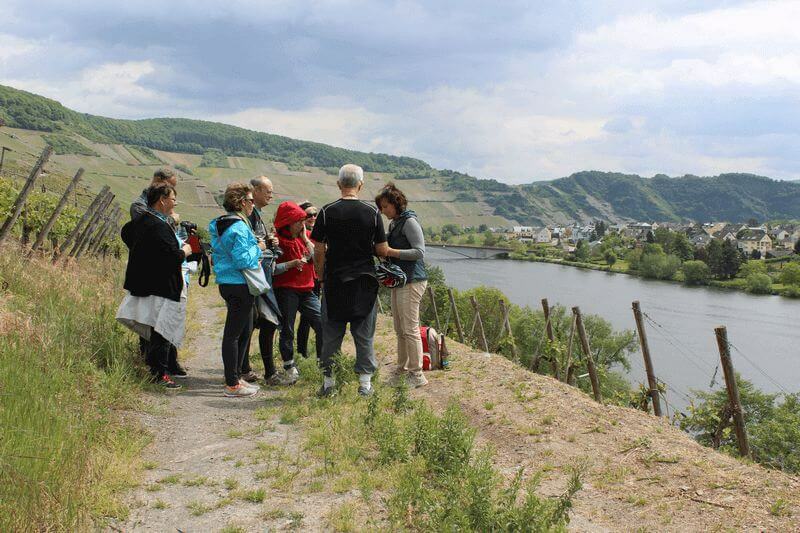 Depending on the nationalities of the participants the excursions are available if necessary bilingual German-English. Welcome aboard of your sailing home, Patria. The cabins may not be that large, but the beds are fine and your bathroom is clean and private. In the spacious salon with comfortable seats and well-filled bar you can order your drinks from the friendly and hospitable crew. On the lower deck there is a restaurant area where you can help yourself to a healthy breakfast each morning and every evening there will be served a tasty three course dinner. Outside, on the sun deck, it is great to take a seat and watch the beautiful scenery. High-quality 28 inch unisex bike from Velo de Ville wit 7-gear. The bikes have a hand- and back pedal brakes or free-wheel hub (please indicate upon booking) and pannier bags. The E-Bikes with a deep entry and a full integrated battery pack from Bosch are also from Velo de Ville. The 8 speed Nexus hub circuit, a Bosch medium Motor and a big 500 Wh battery pack will bring you up to 100 km per loading cycle. Bringing own bicycles: due to limited space on the sundeck are own bicycles only possible on request and after confirmation.